American military prefers to make preemptive strikes. We know this. In America, corporations have enormous influence over the government—these days they essentially run the government. We know this too. And now a giant corporation has made a preemptive strike against nonprofit organizations. “Arctic Ocean drilling: Shell launches preemptive legal strike” is the title of a recent Los Angeles Times article. Shell’s legal attack is against REDOIL—a small indigenous human rights organization in Alaska and 12 environmental organizations fighting to stop dangerous drilling in the Beaufort and Chukchi Seas in Arctic Alaska—Alaska Wilderness League, Center for Biological Diversity, Defenders of Wildlife, Greenpeace, National Audubon Society, Natural Resources Defense Council, Northern Alaska Environmental Center, Ocean Conservancy, Oceana, Pacific Environment, Sierra Club, and The Wilderness Society. This is historic. 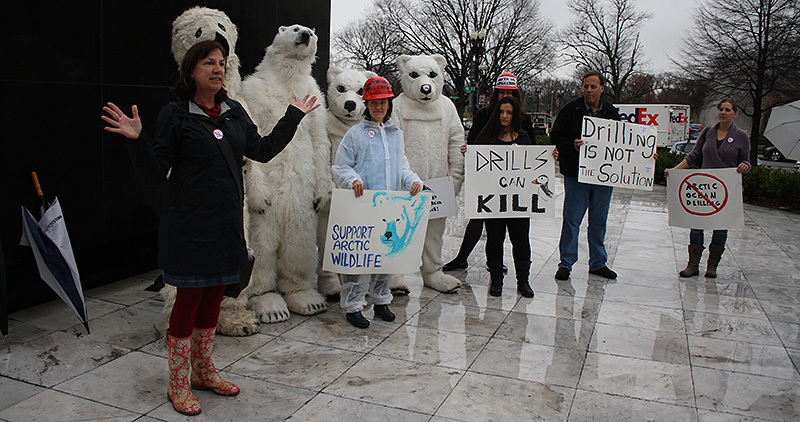 Cindy Shogan speaks during a rally against Arctic Ocean drilling, Washington, D.C., December 2011. “In a true–life David vs. Goliath parable, Royal Dutch Shell, a foreign company that makes millions of dollars in profits per hour, is forcing Alaska Wilderness League, a grassroots–based nonprofit with the sole purpose of advocating for Alaska’s lands, waters and native people, into court—and seeking fees and costs against us. I suppose if you’re like Shell, and you have billions of dollars to throw around, you can engage in this desperate ploy, instead of proving on the ground that you can actually clean up an oil spill in Arctic conditions. How did we get here? I’d suggest through a cruel marriage of two phrases. You perhaps never thought that two phrases could marry, right? And, that they can even produce babies, right? In America, anything is possible. Recently I was at a panel with Robert (Bob) Emmet Hernan, former New York State assistant attorney general. Bob pointed out that something remarkable has happened in the US during the past decade—it is stealing of the meaning of a phrase: “We must reduce our dependence on foreign oil.” Both Big Oil and the environmental activists seized upon that phrase. The activists wanted to reduce dependence on foreign oil and move America toward clean, sustainable energy, and create jobs, lot of jobs, along the way. Big Oil on the other hand wanted to reduce dependence on foreign oil by drilling every place in North America—not easy oil, but what resource expert Michael Klare has called extreme energy—dirty tar sands oil; oil in the deep ocean in the Gulf of Mexico; and perhaps most dangerous of all, oil in the harsh environment of the Arctic Ocean. Bob pointed out, “Big Oil has successfully stolen the phrase reduce our dependence on foreign oil.” That is “Drill, Baby, Drill” everywhere in North America. And, the Obama administration is going along with all those projects (and there is fracking also). That is “Yes We Can” drill everywhere. That is how those two phrases got married. Each time Big Oil wants approval on a dirty oil project, they and their cronies in Congress and Cabinet creatively use “price at the pump” as the most powerful argument to fool the American public. In 2005, when the Bush administration was pushing hard to open up the Arctic National Wildlife Refuge in Alaska—the most biodiverse conservation area in the entire Arctic, to oil and gas development, they had used that same argument—we had high gas prices then too. At that time, activist Carol Hoover and I co–designed an ad in collaboration with Alaska Wilderness League, Gwich’in Steering Committee and The Wilderness Society that came to be known as the Penny ad. The text of the ad began with these words: “According to the latest data from the Department of Energy, if Congress lets the oil companies into the Arctic National Wildlife Refuge, you’ll save a whopping penny a gallon at the pump. 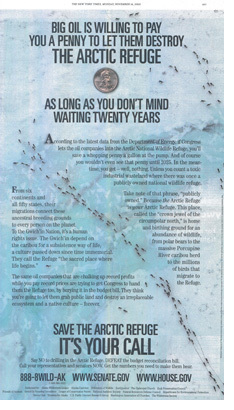 And of course you wouldn’t even see that penny until 2025.” We used one of my photos of pregnant female caribou from the Porcupine River herd migrating over frozen Coleen River as the backdrop. It was printed full page in the New York Times, Washington Post and USA Today on November 14, 2005. You can see the Penny ad here. Because of the hard work of the activist community, we prevailed and defeated all of Bush’s attempts to sell off the Arctic Refuge to Big Oil. So why did Obama make the 180–flip? The obvious reason is that he wants to get reelected, and so he is going where the money is flowing (read: Wall Street, Big Oil, Big Coal). But it’s more than that—US has decided to stay firm on the coaley–oily–gassy path when it comes to energy, rather than make the hard choice of taking the path of clean energy and create real jobs. On February 17 the Obama administration approved Shell’s spill response plan in the Chukchi Sea. But why is Obama giving Shell the key to destroy the Arctic? Unlike Hightower’s assessment of the Keystone XL pipeline issue—the usual Republicans pushing the Democrats argument isn’t true in this case. Despite tremendous opposition from environmental and indigenous human rights organizations, in 2009 when Obama was still riding the wave of popularity, his administration had approved Shell’s plan to drill five exploratory wells—two in the Beaufort and three in the Chukchi Seas. Then, on March 31, 2010 standing in front of an “environmentally friendly” F–18 Green Hornet fighter jet the President had announced a new energy proposal, which would open up vast expanses of America’s coastlines, including the Beaufort and Chukchi Seas, to oil and gas development. BP’s Deepwater Horizon disaster that spilled more than 200 million gallons of crude oil and extremely large amount of methane in the Gulf of Mexico put a damper, and the President did a temporary 180–flip. But slowly and surely his administration has been rubber–stamping permits after permits—for Shell. The government has not done a thorough Environmental Impact Statement; and knows full well that Shell does not have the technology or the preparedness to respond to a spill in the frozen Arctic Ocean, and yet, in approving these permits the administration is essentially saying, “Yes We Can” drill in the Arctic Ocean. If you take a bit of distance from “price at the pump” and other bogus arguments, you’ll realize that North America is determined to stay on course with fossil fuel driven energy for this century, and avoid any significant direction toward clean, sustainable energy, and deal with the devastating issue of climate change—the greatest challenge humanity has ever faced. That is a major crime against all species of this earth. In 2010, I wrote a piece, “STOP: Another One Hundred Years of Fossil–Digging in North America?” that you can read here. That nightmare is becoming reality now—Shell’s Arctic Ocean drilling; Keystone XL pipeline and consequently massive expansion of tar sands extraction in Alberta; and major expansion of the deepwater drilling in the Gulf of Mexico—are all moving forward. Right now I’d urge you to sign the Alaska Wilderness League petition, Tell the President: “Shell No” to Arctic Drilling. And, fight, yes, fight we must against all those who like to steal phrases, and along the way steal the meaning of survival for all species on earth. It is possible to defeat destructive projects when a community fights and keeps on fighting. Just in the last two weeks we have had two good news—the New Mexico anti–nuclear campaign stopped after an eight–year long battle a Plutonium Bomb Factory; and the anti–coal campaign in Chicago after a decade–long battle shut down two Model–T–era coal fired power plants in a historic victory. I recently edited an anthology “Arctic Voices: Resistance at the Tipping Point” that will be published by Seven Stories Press in June. In the book we offer many stories and ideas of resistance–against–destruction. You can also check out the ClimateStoryTellers special series on Shell’s Arctic drilling here. The US government continues to ignore what the Iñupiat people and the environmental organizations have to say about Shell’s Arctic Ocean drilling, so it is no surprise that we are at this historic moment when an Oil Giant has made a preemptive legal strike against these nonprofit organizations. Only two centuries ago the US government supported a policy that exterminated nearly 50 million buffalo in less than one hundred years and destroyed the way of life of the Native American communities. Will the US government repeat that today by sending Shell to the harsh Arctic Ocean and along the way destroy the rich marine habitat and the way of life of the Iñupiat communities? Note for readers: I’d like to thank Cindy Shogan, Leah Donnahey and Gwen Dobbs of the Akaska Wilderness League for their help with our ongoing series on Shell’s Arctic Ocean drilling. Subhankar Banerjee is founder of ClimateStoryTellers.org, and a leading voice on issues of arctic conservation, resource wars, indigenous human rights, and climate change. He recently completed editing an anthology titled, Arctic Voices: Resistance at the Tipping Point (New York: Seven Stories Press, June 19, 2012). His arctic photographs will be shown this year at the 18th Biennale of Sydney: all our relations. He has received Cultural Freedom Fellowship from Lannan Foundation, Greenleaf Artist Award from UNEP, national conservation awards from National Wildlife Federation and Sierra Club, and was named an Arctic Hero by Alaska Wilderness League. Subhankar is currently a Distinguished Visiting Professor at Fordham University in New York.